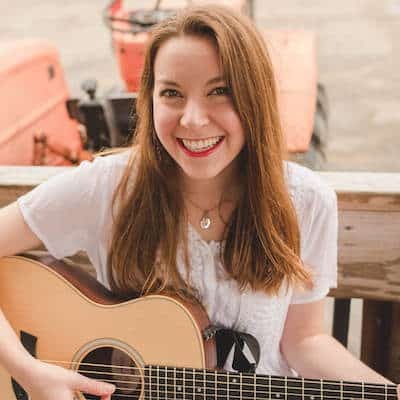 In this episode of Stories from the Road, Sam interviews Marc and Julie Bennett of RV Love. 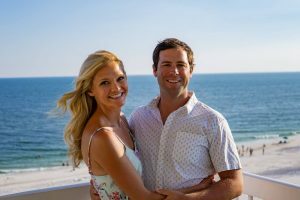 Marc and Julie are full-time RVers who have been traveling for the past 4 and 1/2 years. It’s easy to tell that they really love RVing. 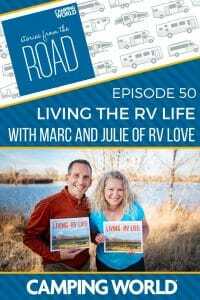 They love it so much that they even co-authored together the bestselling book “Living the RV Life – Your Ultimate Guide to Life on the Road.” Marc and Julie share their adventures as RVLove at their blog, YouTube Channel and on social media, and recently appeared in the RV Nomads movie. 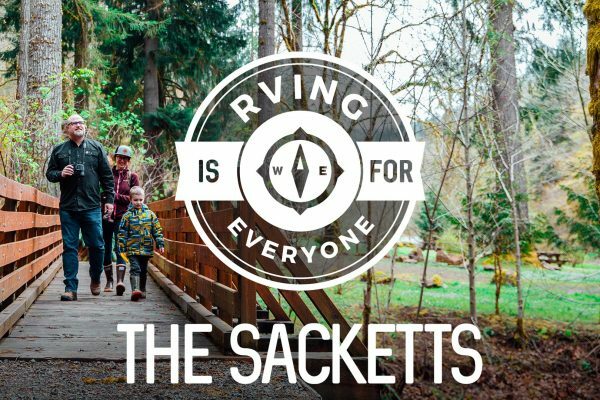 They also run online courses to help you hit the road as an RVer at RV Success School. They are best known for their positive attitudes and practical advice. 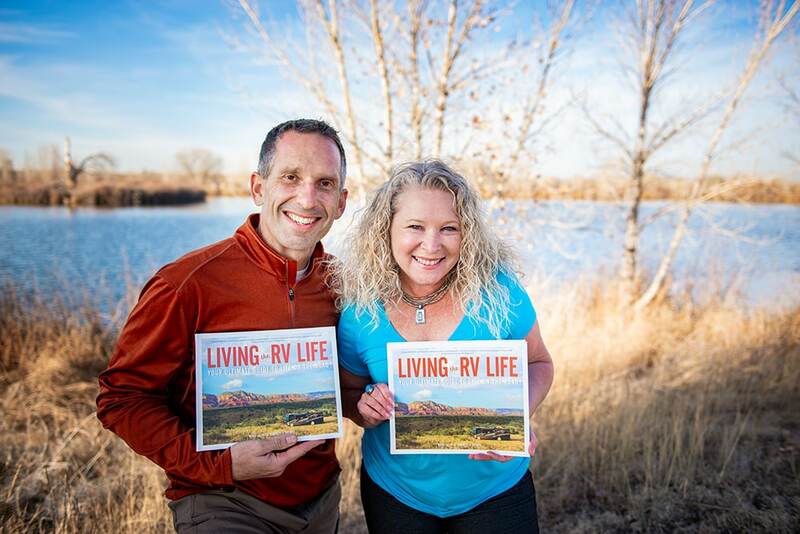 Their mission is to empower, entertain, and educate others considering living the RV life. 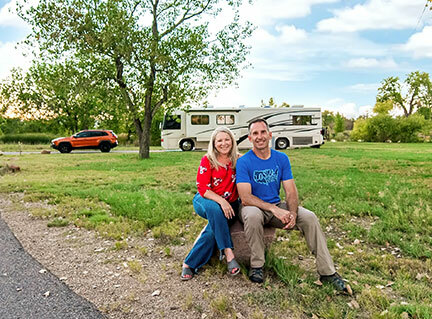 In this interview, they share some really great tips on why RV life is so great and how to make the most of your travels. RV life: You never run out of experiences, you never run out of stories, and you definitely never ever stop learning. RV breakdowns: Keep a good attitude during these times. Breakdowns are always stressful. Remind yourself that someday this event could make a great campfire story. Try to find humor in your situation. Being present: Life slows down more when you’re in an RV and you’re able to be more present. Socializing: Your social life is much more active in RV Life. It makes you more relaxed and open to chats. You might also be open to making 6 hour detours to see friends who are “close by”! Enjoy new perspectives: Get behind the wheel and see the world with fresh eyes. This book is the road map to living a mobile life. 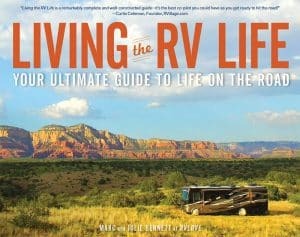 What’s really special about this book is that it features 256 pages of important RV living tips with full color images, so you’ll get a complete vision of what RV life is really like. No more need to worry over how to get started in RVing, where to set up domicile, or what RV to choose. 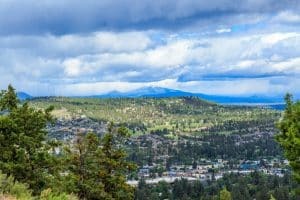 Whether you’re an RV beginner or an experienced RV pro, you’ll find something to enjoy and learn in Living the RV Life.